Prior to this interview, I very much thought of Rob Ryan as a man who cuts paper. Intricate, detailed, wondrous paper but a skilled papercutter none the less. I was wrong. Rob Ryan is an artist and wordsmith who happens to use paper as his medium of choice. No doubt you’ve seen his work before; maybe in a magazine, a gallery, on a card in a gift shop, perhaps you even own one of this books. Here, Rob talks to The Holborn about his work and how he weaves words and stories into his images. He also calls me out on my lame interview questions: what can I say, I was so excited to interview him I forgot what I was doing! What do you believe is the greatest British design ever? Double decker buses? Mini skirts? I was pleasantly surprised to see that the red telephone box has been voted our number one iconic design, despite them only seeming to exist for tourists to take selfies in front of these days. Later this year, you may notice your pound coins are shinier and look a little different. There is a new portrait of the Queen coming out and seeing as she’s only had four other portraits since her coronation in 1952, it’s a pretty big deal. If you live in London or simply love fashion, it can’t have escaped your notice that a major new exhibition has recently opened. A truly great British designer, the Alexander McQueen ‘Savage Beauty’ retrospective has finally arrived at the V&A. Bold, beautiful and daring, the exhibition showcases what made McQueen such a genius. Currently, there are no weekend tickets available until June, so get booking asap. For all those ex-skateboarders, check out the 2015 version – a skateboard without a board. An incredibly devoted fan of type, this gentleman dived into the Thames looking for an original typeface that had been thrown in the river over 100 years ago. We at The Holborn are both proud Londoners, lovers of great design and ingenuity and quite unashamedly railway enthusiasts. So we jumped at the chance to explore a hidden gem of London life, the abandoned Aldwych Tube station. Two classic gentlemen’s brands combine to create something extraordinary: a bottle in a brogue. 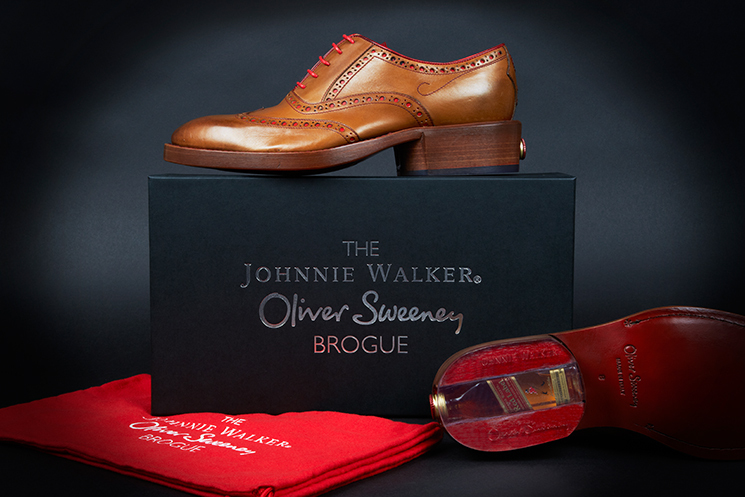 For the ultimate in undercover booze smuggling, these Oliver Sweeney shoes conceal space in the heel for a little nip of Johnnie Walker. The heel size needed to store the miniature bottle can add a cheeky boost to your height too, if needed. Well Suited: A visit to Henry Herbert, Bespoke Tailors. Ever watched a film and been too distracted by the brilliantly designed furniture to concentrate much on the storyline? If so, Film and Furniture is the place to be. Find out where to source the Pixar lamp, Mad Men tumblers and Star Trek chairs. How brilliant is that?! A trampoline! But not just any trampoline. The longest trampoline in the world is coming to Southbank in 2015. Definitely beats the tube in terms of a fun commute. 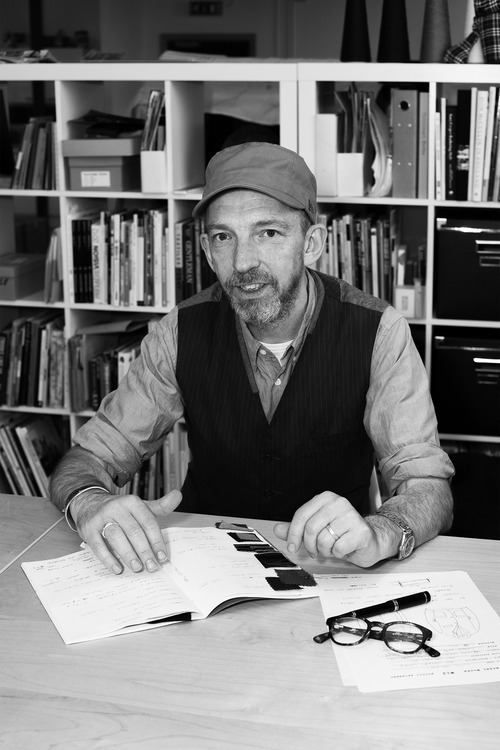 and graphic designers, who have pioneered a collaborative user-led approach to design called ‘codesign’. Working as a designer-maker in the capital (or anywhere) is hard. With no magical marketing fairy whispering into potential customers ears, how the heck can people know about the talent we have to offer? This is where Sophie Rees steps in. As Director of Designers/Makers (D/M), her energy and passion for design led to her developing an agency focused purely on supporting our creative folk. Housing an online shop, monthly markets (giving customers the opportunity to discover the ‘face’ and story of their purchase) and an incredible amount of business support, D/M is revolutionary with its selfless dedication to promoting new makers at a time when they need it most. Sophie kindly took some time to introduce D/M to The Holborn readers. If innovation, technology and efficiency are words evoked by the mention of the current American ethos, then George Vlagos could be considered quite un-American. But, almost ironically, it is his patriotism that guides every stitch in Oak Street Bootmakers footwear. Thirty years ago, a friend showed me a book given to him by his sister, a silversmith and bookbinder. It was an old volume of Coleridge’s ‘The Rime Of The Ancient Mariner’, which she had bound it in soft, matt, black leather. The hide was carefully pinched and puckered to represent the ocean and an inlaid solid silver albatross hovered above the waves. I will never forget that book. The look, the feel and the smell of it will stay with me as long as I live and I can only describe my feelings towards my friend’s precious gift as pure envy. Quite often at The Holborn we have a tendency to feature items that have just caught our eye, something that has gotten us excited over the course of a quick browse of a website or trying out such an item out the shopfloor. This is not the case with Cherchbi – a British manufacturer of fine bags, leather goods and accessories. The Holborn’s admiration for Cherchbi is a long, brooding love affair that has developed over many years. When The Holborn’s founders took their seats at a Sun-drenched wooden table twelve miles outside Carcasonne, they spoke long into the l’occitane night of the homegrown brands that each thought exemplified The Holborn philosophy; Cherchbi was one of these. It stood to reason then, that we should get in touch. So it came to pass that last week that I popped along Lambs Conduit Street to meet with Cherchbi’s founder, chief designer and all round nice bloke Adam Atkinson. After out initial greeting, I asked Adam how Cherchbi came into being? Where had the idea come from? Adam tells me that it was something of a happy accident. 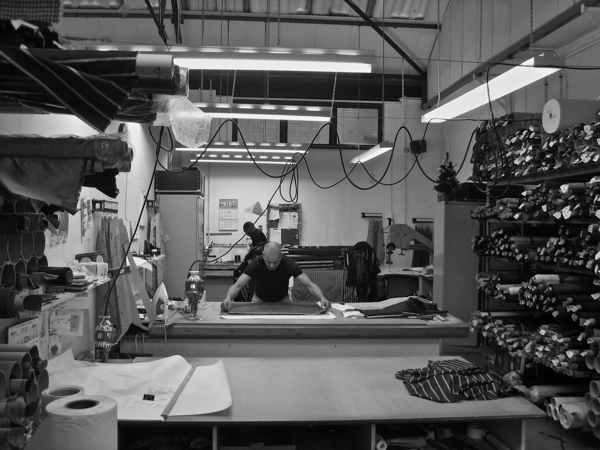 At the age of thirty six Adam returned to Britian, after spending a number of years living abroad , working on and developing bags for some of the largest brands around – including Nike (Adam had trained in menswear at Newcastle before moving onto work in luggage). A little tired of London, Adam settled on the natural beauty of the Lake District as the place to work freelance, and take the time to really think about his designs and priorities. It was while perusing the back pages of The Westmorland Gazette that Adam learned of a protest by local hill farmers who had taken to burning the wool of the ancient Herdwyck sheep, a breed singularly bred for meat and of whose wool was callously deemed undesirable for re-sale (prices for the wool reaches as low as ten pence a kilo). Adam’s interest was piqued, he began to carry out research into the Herdwyck herds. The breed had nearly been wiped out during Britain’s Foot & Mouth outbreak in 2001 and what followed was a prolonged effort to restore the breed to the hills of the lakes. As Adam describes it the sheep are seen as part of the landscape and culture of the North ”heritage as an animal’ as he puts it. 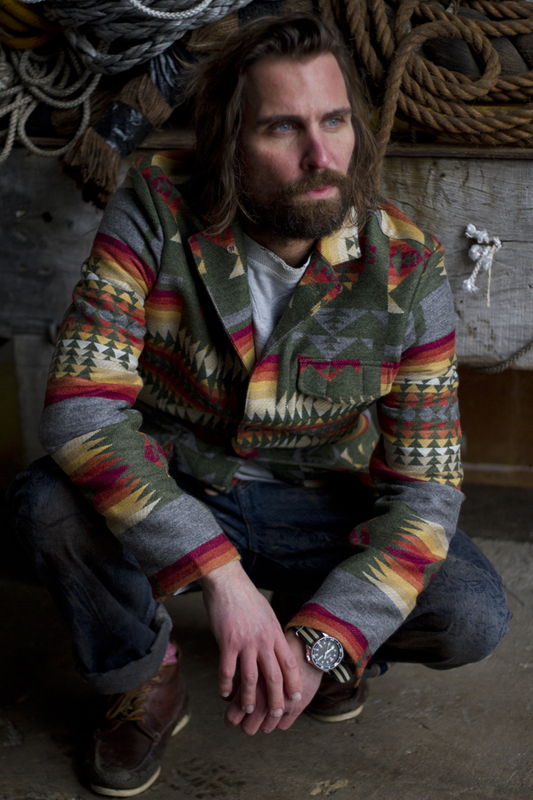 Adam says of his products ”They should always reflect the landscape…to where I was (Cumbria) at the time”. 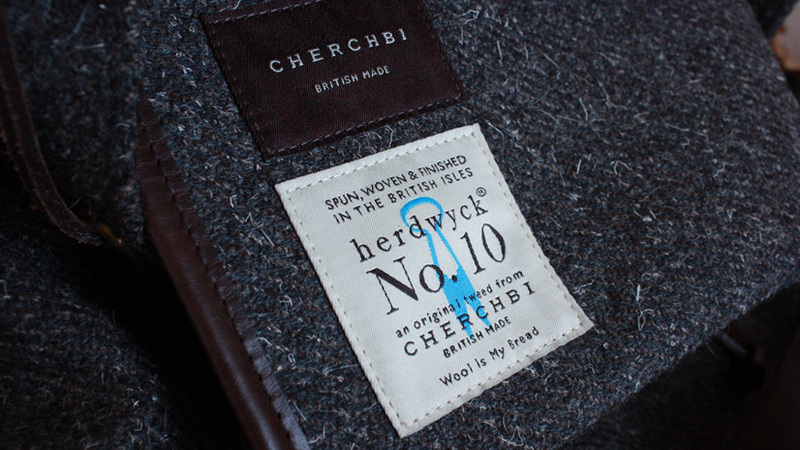 It would be fair to say that the Herdwick tweed that features so predominately in Cherchbi’s collections is the anchor of the brand. Adam agrees, despite moving into full leather products, the tweed will always be a feature at Cherchbi. Adam then shows me some swatches of the Herdwyck No. 10 tweed, it is a real feat of weaving, there are so many layers to it, subtle shades that are never quite the same, a light, white downey thread peppers the surface – a feature Adam tells me that quietly disappears with age and use. The idea of a material that ages with its owner and visually reflects its own quality and hardiness is something that really excites The Holborn about Cherchbi’s products. Adam proceeds to tell me about the No.10 tweed itself. ”It took three years to perfect..working with different spinners and weavers… it was troublesome to work with as the machinery had to be adapted and it slowed production down”. Adam finally settled on a spinner in Kilcar, County Donegal ”The spinning process is slowed giving the yarn greater strength. This is woven into cloth in Pembrokeshire, Wales. 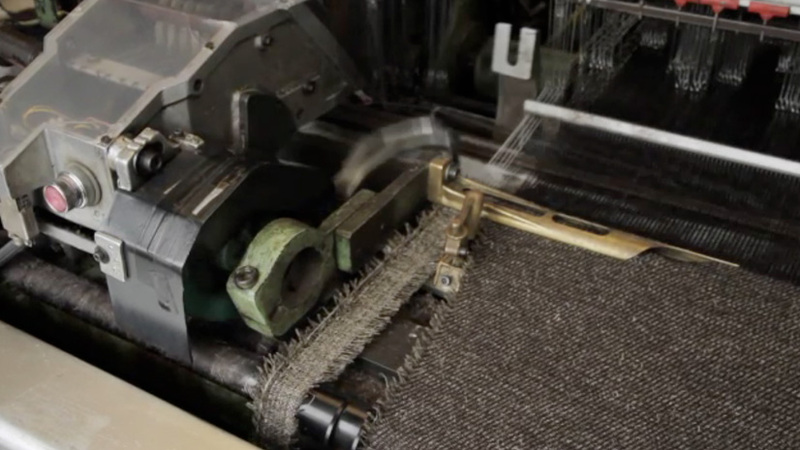 Extra picks are added into the loom creating an unusually dense weave. The tweed is then sent to finishers in Galashiels where it undergoes a specialist ‘wash & press’ finishing. Finally at Fergusons in Lancashire, the finished wool tweed is bonded to its cotton lining with a natural rubber core”. The result is a soft, strong tweed of which the quality and durability (”firmly waterproof”) is clearly evident. 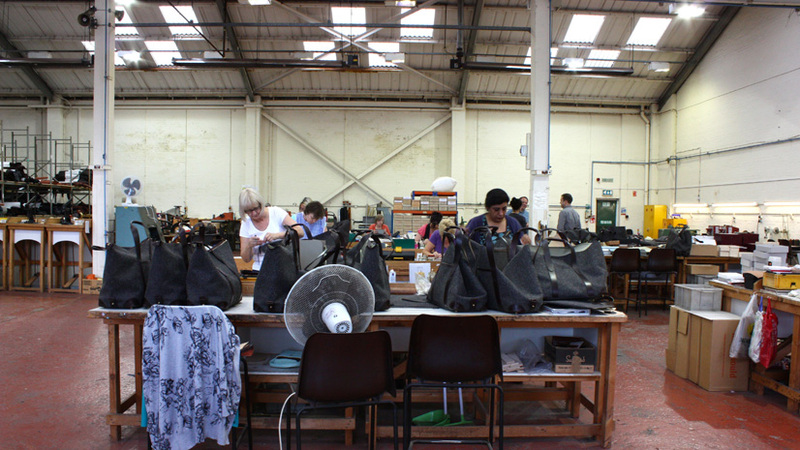 ”The bags themselves are made in a twelve person workshop in Walsall, they are bench made, a method ideally suited to small scale, batch production”. 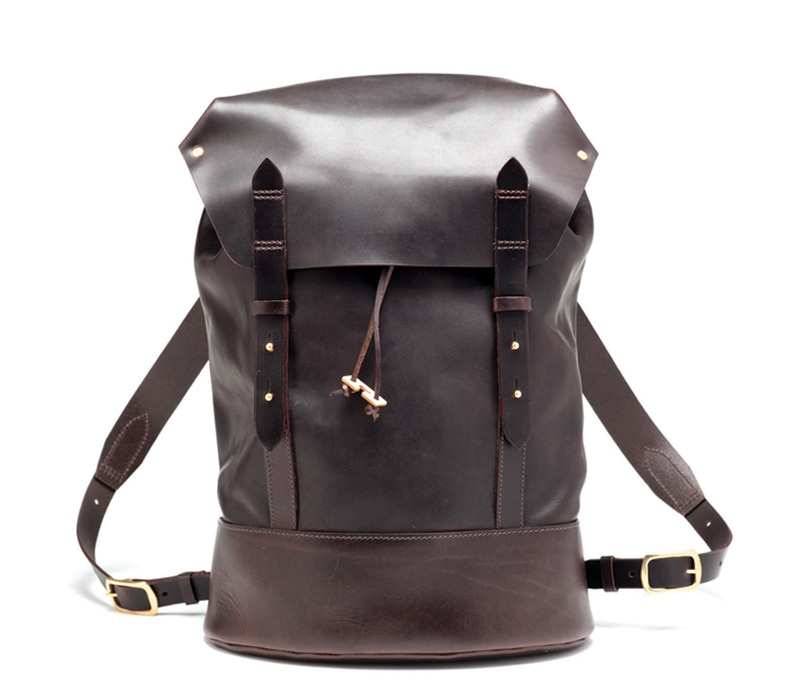 As I’m talking to Adam, I notice that he has a beautiful, full leather rucksack sitting next to him. It is an alteration on the Cherchbi’s ‘Black Sail’ model, and I tell you dear readers it is just something to behold. Adam tells me that the leather comes from the raw hide of Hereford cattle, which come from the same farm in Northern Ireland and the same gender to ensure a consistent level of quality throughout. It is then taken to J.Clayton tanneries in Derbyshire whose 180 year old pit tanning process (using natural, tree bark tannins) brings a subtle ”Old school inconsistence” to the leather. 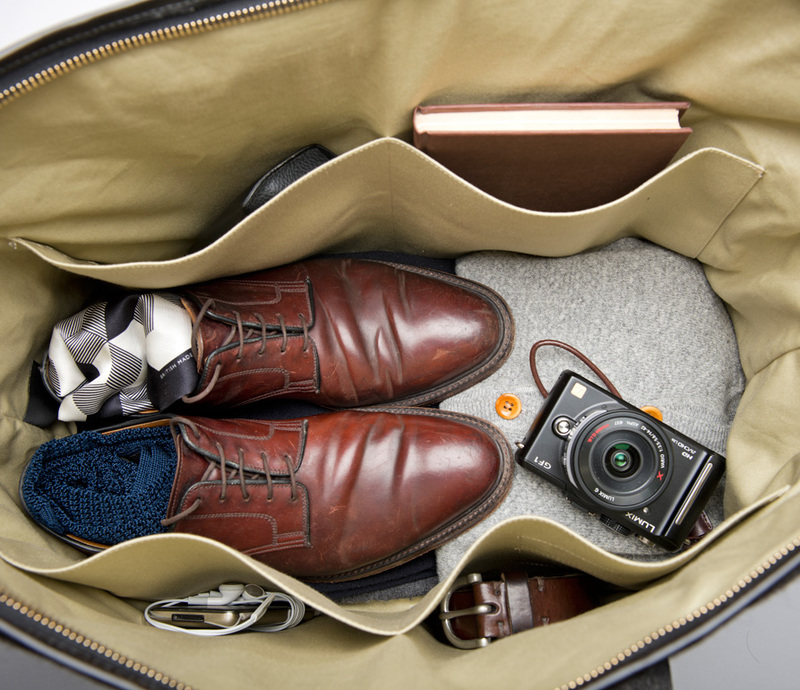 Adam passes the bag to me, it’s reassuringly weighty with a patina that many shoemakers would sell up for. 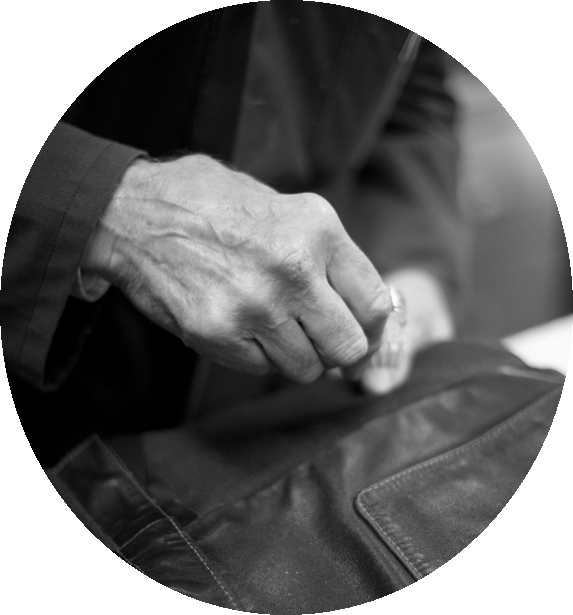 The shine Adam tells me comes from retaining the natural oils that have been returned to the leather, a feature that will ensure that the leather ages with grace and grows softer over time. Cherchbi has started producing belts and they’re currently working on a range of wallets (including an intriguing watch-wallet) and accessories that will showcase their leather credentials in full. Suddenly aware of the time I reluctantly move the conversation onwards, I ask Adam about the Cherchbi design process. Adam retains ”full design control”- the first few designs were made on his kitchen table. 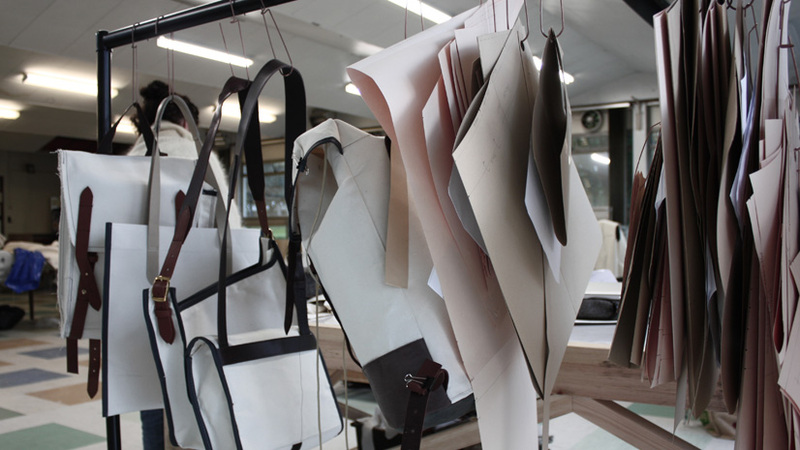 After the initial sketches, mock up’s are made in Calico ”which prove the construction, shape and size of each bag…the mock-ups and corresponding specification drawings are revised until both are correct then passed to the sample and pattern maker who produces a prototype. 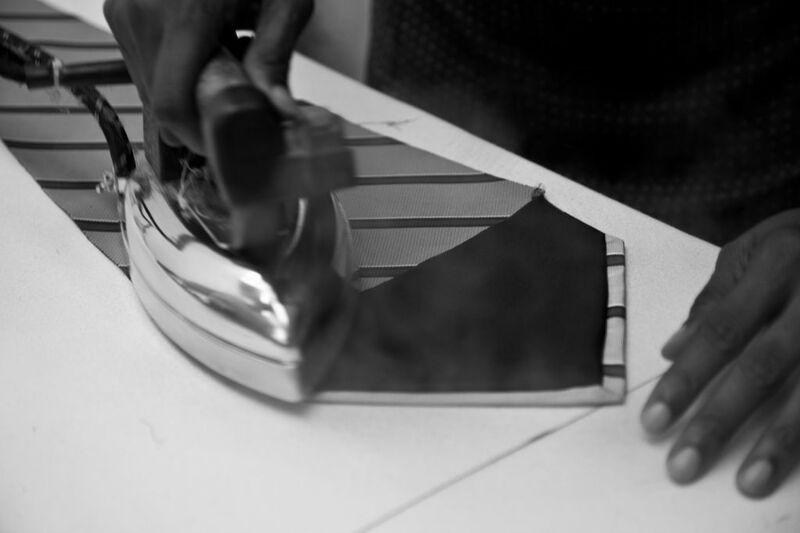 After review and further revisions a final sample is made in the correct materials”. I ask Adam about trends, ”you don’t just go completely on your own…(Cherchbi) takes inspiration from British creativity both old and recent”. Cherchbi does a great job of introducing new materials into its collections whilst never straying far from its utilitarian, functional design. Materials such Cherchbi’s collaboration with Tamasyn Gambell, resulting a screen printed Herdwyck No.10 which brings very individual but tasteful character to their range. After another ten minutes in which Adam and I discuss the wider heritage scene in general (topics included Burberry, Japan, Ri-Ri zips, Eastman Leathers, Lissom & Muster, Private White VC and S.E.H Kelly) I remember that I am here to ask questions about Cherchbi and so I bring up the topic of Cherchbi’s future plans, Adam teases with reference to a Herdwyck No.10 jacket he’s had made, there is also some new materials on the way such as cotton canvas and a seasonal summer sailcloth, plus a collaboration with British tailoring legends Hardy Amies. I also sense a hope from Adam that the Herdwyck No.10 Tweed will take on a life as its own as a material to be sold wholesale, such is its outstanding quality and character that I have no doubts as to this venture. I realise that it’s probably time for me to let Adam get on with the more important tasks of his day and so with one last, longing glance at the Blacksail rucksack a bid my farewells. Meeting Adam has, if possible increased our admiration for Cherchbi threefold. They really are a brand which should be placed on a pedestal as an example for how to go about founding a business. Adam, took his time and found the best people to make his products because he knew that his idea was a good one and that in the end – it would be worth it. 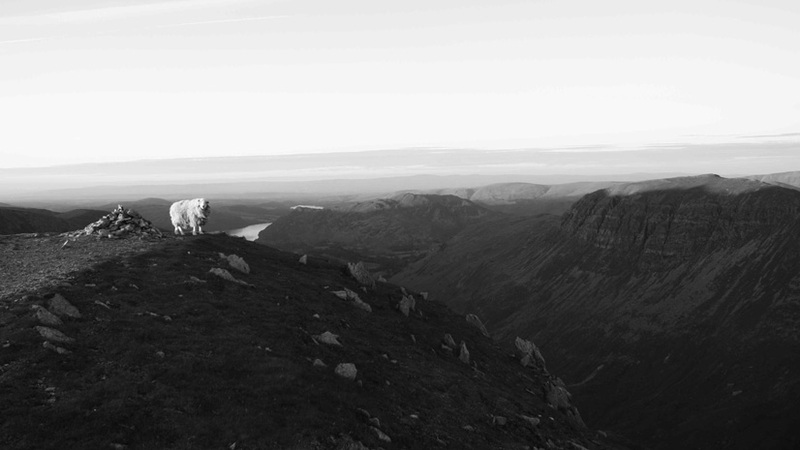 Cherchbi succeeds in reflecting Adam’s transitional time in the Lakes and those hardy, ancient sheep. Cherchbi honours them with the hard work and respect that such an incredible landscape deserves. The business side of Cherchbi also represents clear leadership, quality design and a solid model for the direction of the future of homegrown, British manufacturing. Our thanks to Adam and Dan at Cube Company PR. So how did HR get started? How did you actually go about getting the company up and running? It started out as an ongoing project essentially fuelled by our interest in historical and military garments and their application in contemporary style. I’m the type of consumer that requires context within the things I buy so we decided to create a brand where every piece directly references a garment from the past but isn’t necessarily an exact copy. It was initially a side project, we found a small studio run by ex-Savile Row tailor Paul Hubbard and worked with him on developing a capsule collection. 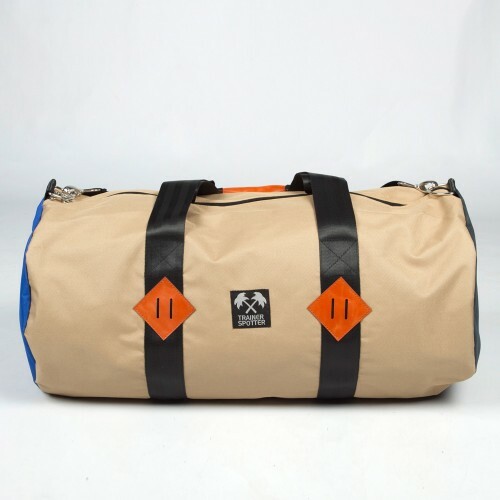 We initially sold to a few handpicked accounts in Japan but at the time the market was shifting in the UK and Europe and we started to get a lot of enquiries, so approached some key UK stores and it took off. After a while the demand became such we had to move to a larger production base that we hoped had the same skill and knowledge. What kind of elements inspire you during your design process? Our influences can come from anywhere, at the moment I’d say USMC WWII and Vietnam era military clothing, the photography of Tim Page and Ron Stoner, American Civil War uniforms, Dennis Wilson, Californian motorcycles clubs of the 1940s, Will Oldham, John Ford’s The Searchers, John Steinbeck, 1940’s Aloha shirts, Flight Jacket art. Where do you source the fabrics for your clothing? What have been your favourite fabrics to use? We’re actually sourcing most of our fabrics and cloth from Japan now, the mills over here just can’t compete with the quality and variety. Also, the Japanese bought most of the original narrow looms from the UK and the US in the 80s and 90s so they can do things we just can’t do anymore. The UK essentially sold off its manufacturing heritage and is only just realizing the mistake. For Spring/Summer 2012 we used a lot Japanese narrow loom layered patchwork hand embellished cottons which were beautiful, these are possibly my favourite fabrics alongside some of the hickory denims also from Japan. 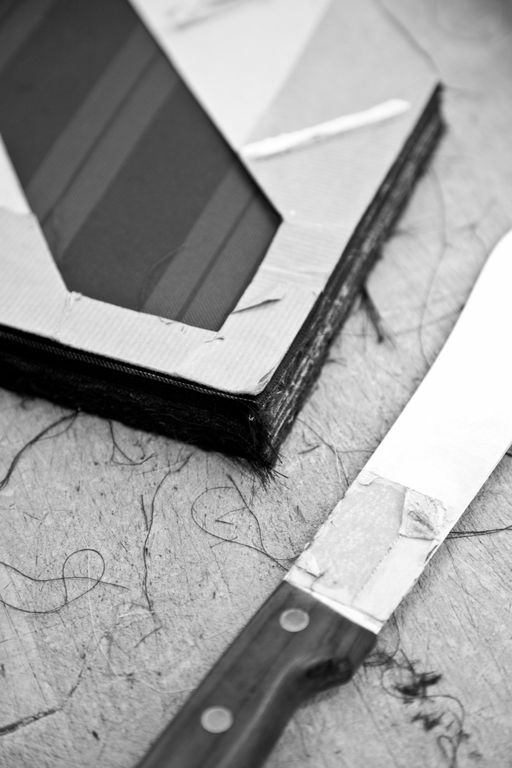 How do you ensure the quality of your product? Where are they manufactured? Both pertinent questions at the moment as we’ve recently had to change manufacturer due to their inability to produce garments to our required standard of quality. I won’t name names but they’re based in Lancashire and are making quite a bad name for themselves in the industry at the moment for this reason. Just because a factories been in business for a 100 years doesn’t necessarily mean their product is any good nowadays, something we’ve learned the hard way. We’ve now looked to Japan, arguably the last bastion of real craft left. The attention to detail when working with the Japanese is second to none and their skill base and knowledge of traditional methods and fabrics is actually more apparent than in the UK, they seem to have valued and nurtured knowledge. What kind production techniques go into making one of your garments? We use a number of older processes of making clothing that don’t generally exist anymore in an age of production lines of machinists, conveyor belts and laser pattern cutting. A lot of these techniques have their origins in 19th century English tailoring. 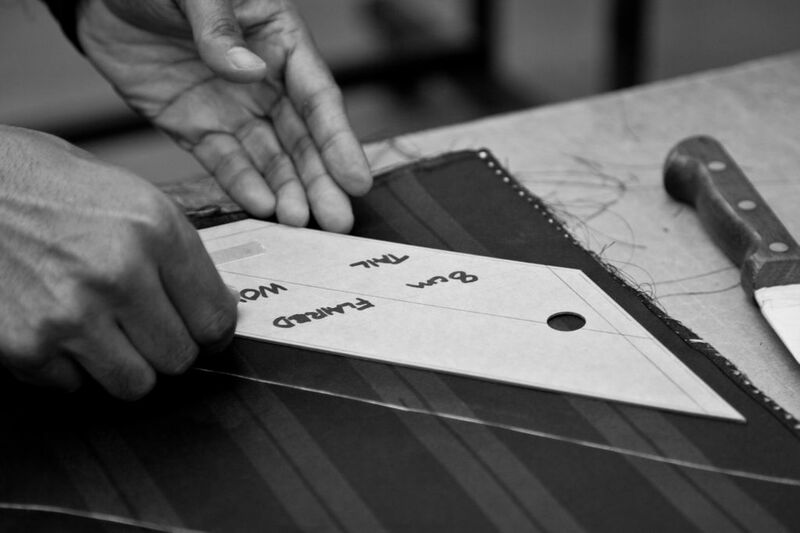 All of the HR patterns for each style are bespoke cut by hand allowing for subtle adaptations as the garment is developed, we want to ensure the garments are ‘crafted’ rather than ‘produced’ as each team member is physically connected to each individual piece in the way that a traditional tailor works by hand and is connected to everything he makes. Hand stitching is used on elements of each piece such as the bluff pocket on the Artillery Jacket which features an old tailoring method where the stitch is invisible, hand folded seams, authentic shank cuffs, elements you would usually only find on a bespoke garment. 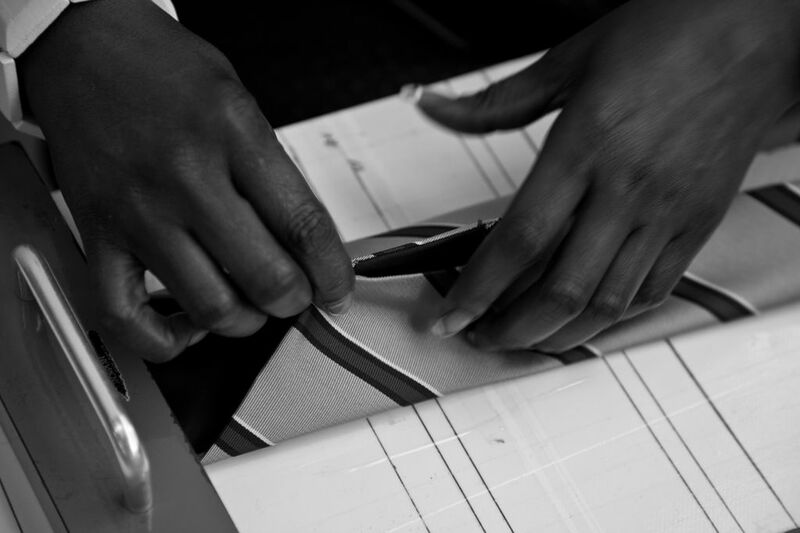 Our processes use only the simplest machinery to ensure the garments retain the feel of a bespoke piece and not the homogeneous output of a large factory. We like the fact that each piece is slightly different and not every stitched seam is exact to the mm. How important do you think it is to support and maintain local production? Its important as long as the local production base is skilled and competent. We made it our mission to produce a true made in England garment using English fabrics but I have to say failed in some respects. That’s not too say that all UK produced garments are bad, not at all, they’re still very good comparative to most worldwide production however compared to the quality of a brand like John Lofgren from Japan then I believe the UK doesn’t have the ability to meet this standard with the exception of someone like Eastman Leather Clothing who make exacting replicas and are the World leaders in that area. Is the ‘Made in Britain’ brand a guarantee of quality? No! Definitely not. There’s a lot of factories out there latching onto this made in Britain trend who genuinely don’t have the abilities or understanding to produce quality clothing, see question 4! If you visit any East London industrial estate you’ll find a sewing factory which is essentially making garments in England, the quality though is open to debate however I’d say some of these are preferable to a lot of the factories in the North of England currently selling themselves as something they’re not. The reality is that most of the best UK made garments are done so in 1970s industrial buildings on London or Birmingham trade estates not in 150 year old aesthetically pleasing buildings in the North. That said, it is site specific, there are still some beautiful British made products out there, Eastman and Tender are both great examples. You just have to know the right production bases or do it yourself as Gary Eastman has done. Tell us about your other brand Trainerspotter, what are the ideas behind it? Trainerspotter is really a vehicle for our interests in American popular culture. 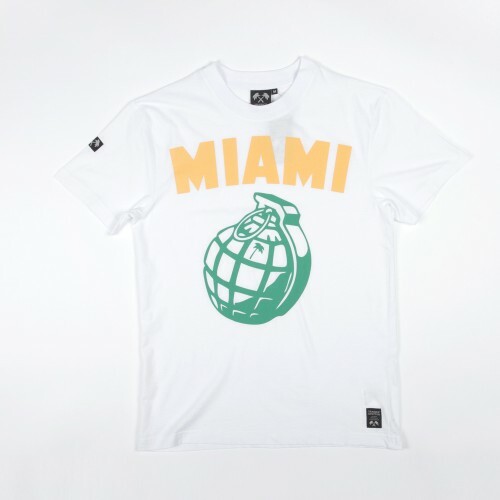 A lot of what we do is drawn from a love of art (Haring, Warhol, Lichtenstein, Basquiat, Koons), television (specifically Michael Manns original Miami Vice series where he enforced a specific colour palette and styling for each episode) and sneaker culture (alongside military, denim and workwear we also collect 1970’s Nike sneakers, apparel and advertising). Some of our design from Heritage Research definitely spills over into Trainerspotter which creates a kind of post modern garment in a way, real street style I suppose, form over function! The collections are fun but also subversive to a certain extent while remaining wearable. As fashion should be! Do you have a personal favourite piece from HR? What would you wear it with? 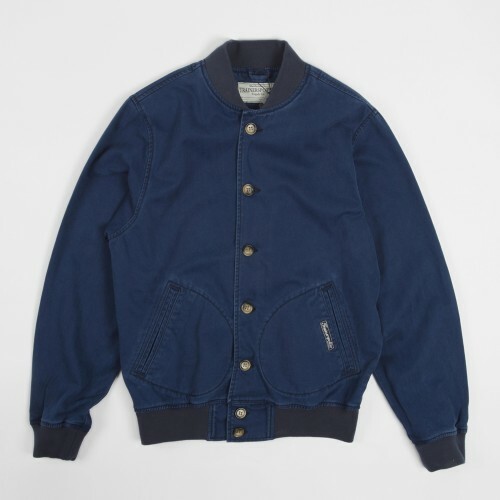 I think the Eastman x Heritage Research USN G-1 flight jacket is my favourite, a beautiful handmade garment that will always be in style and will last for years. A true piece of craftsmanship. I’d wear with a vintage 50s sweatshirt, a pair of Lofgren work pants and Lone Wolf Lineman boots. 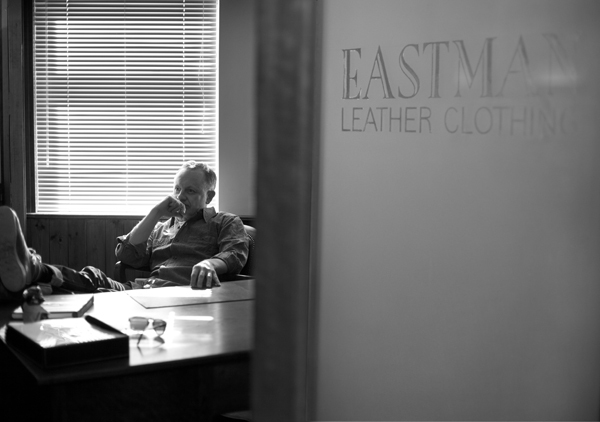 Q&A – Gary Eastman, Eastman Leather Clothing. Eastman Leather Clothing has been in business for over thirty years now, located at its long standing premises in Ivybridge in Devonshire. 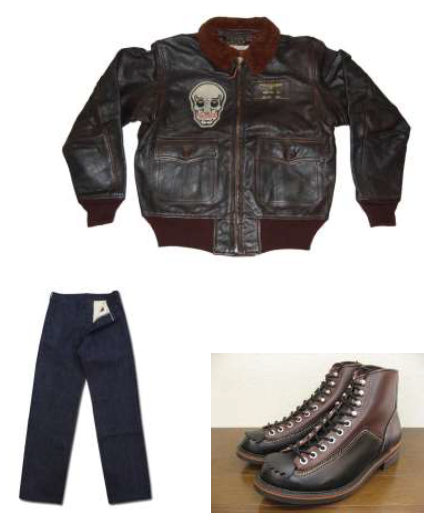 Since their inception they have always specialised in flight jackets, particularly the military styles from WWII. Over the years they have acquired a unique expertise in this area that is considered by industry insiders as second to none. Due to their extensive, persistent research about the original cuts and materials used, Eastman learned how to perfectly reproduce period Flight Jackets using similar practices as employed during the 1930’s. Such is the accuracy of Eastman’s research that they have become desirable garments for use in period filmaking. Eastman Jackets have appeared in Hollywood Blockbusters; Pearl Harbour, & Red Tails. Within menswear too, the quality of the jackets is such that Eastman have been attracting collaborations from newer brands with younger profiles such as You Must Create (YMC) & Heritage Research. 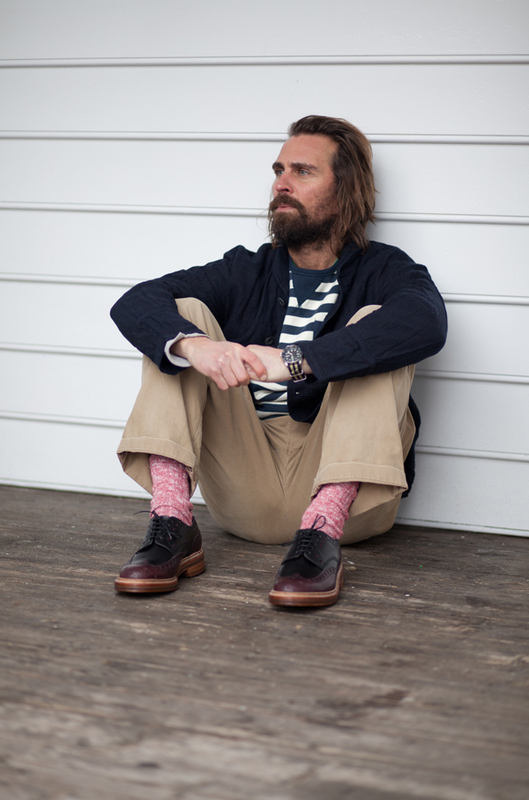 The Holborn decided to get in touch with founder Gary Eastman to find out more.. So how did Eastman Leathers get started? How did Eastman actually go about getting things made at the start? ” I started my company in July of 1984 on Margaret Thatcher’s Enterprise Allowance scheme. I was a printer by trade, having done a 5 year apprenticeship from 1978 – 1983, after leaving school. I took a year out after finishing my apprenticeship, and went to the US. 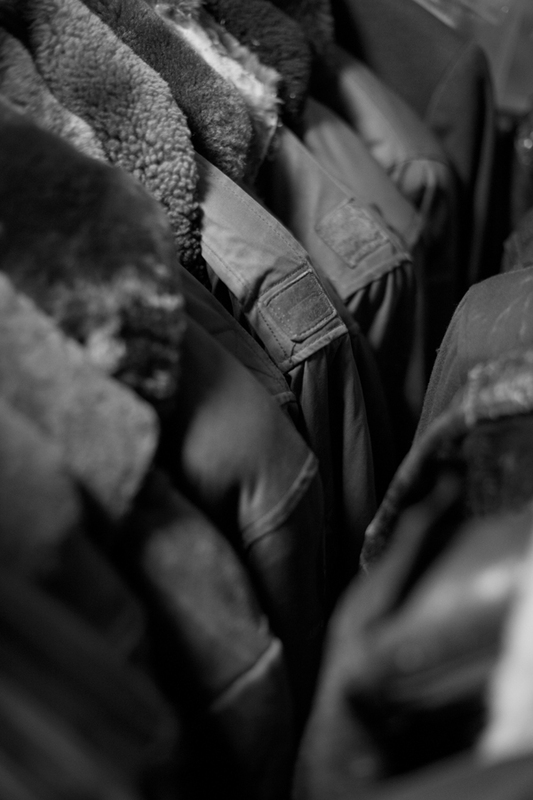 While I was there, I followed my nose and dug around for that which I had a passion for – vintage flight jackets. The US certainly proved to be quite bountiful in that regard – having previously had to make do with scouring the vintage clothing stores in London, like FLIP (that’s the original FLIP that was in Long Acre Road, Covent Garden) for such articles. I came home with quite a bunch of garments, and started selling them in the Exchange & Mart – there used to be two whole pages devoted to militaria in that periodical back then, and that was the place to sell vintage flight jackets. Unfortunately, the trade I had spent 5 years learning was in decent – desk-top-publishing was fast replacing the traditional method of print, and so I found myself struggling to find work. I fancied doing something in the field of vintage clothing – especially flight jackets – but sourcing enough originals to make a living was tough – it was then that I hit upon the idea of making very accurate reproductions. I figured: people really want to wear these things, but generally originals are too hard to find, don’t fit, and are too delicate to wear, so a good reproduction could be a good alternative. I went to the library and took out some books on pattern making and grading, borrowed my Mothers sewing machine, and with a few old bed sheets made up a rudimentary toile to see if it could be done. Several attempts, and several bed sheets later I was reasonably confident enough this might be possible. I took the small amount of money I had from selling the originals I brought back from the US, and went to London and bought an old 1930s singer sewing machine, some leather, other trim parts, and set about making the first Eastman A-2s in my garage. I was able to produce 5 garments from the first batch of leather I bought, and they all sold in the Exchange & Mart within a week. I carried on like that for about 3 years, whereupon I employed my first sewing machinist in 1987, and not long after, my Father (who had recently been made redundant from the print trade as well), to help with the cutting – he still works at Eastman to this day, and so does that first machinist. Since then I haven’t looked back, or even had time to think about looking back, – it’s as crazy busy today as it ever was – nearly 30 years have passed – ha” . Where do you source the fabrics for your clothing? ” The main material of course is leather and sheepskin. These can be sourced from anywhere in the world, but generally it comes from Italy and the US. 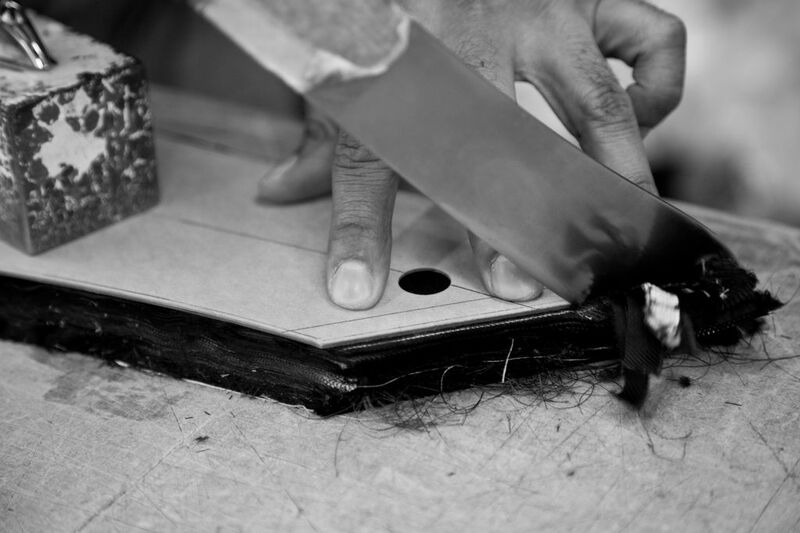 We quite often use finishers within the UK to finish leather crust the way we want it – i.e. the crust is brought in from overseas, and then the dying and finishing is done here – it’s easier to monitor the spec that way. 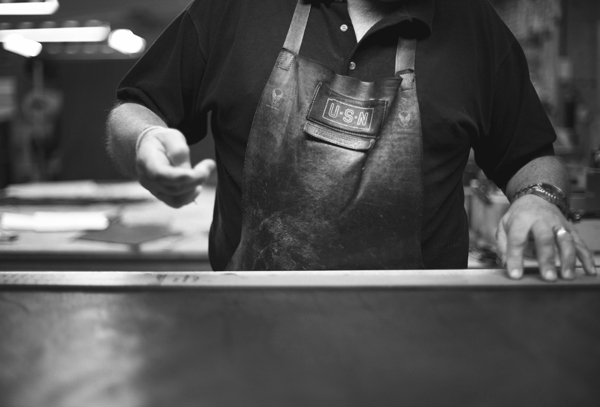 However, some overseas tanneries have good finishing departments as well, and so some of them can be relied upon to supply the finished material just as you want it – but it’s gamble to do that with everyone, which is why we often use finishers in the UK”. 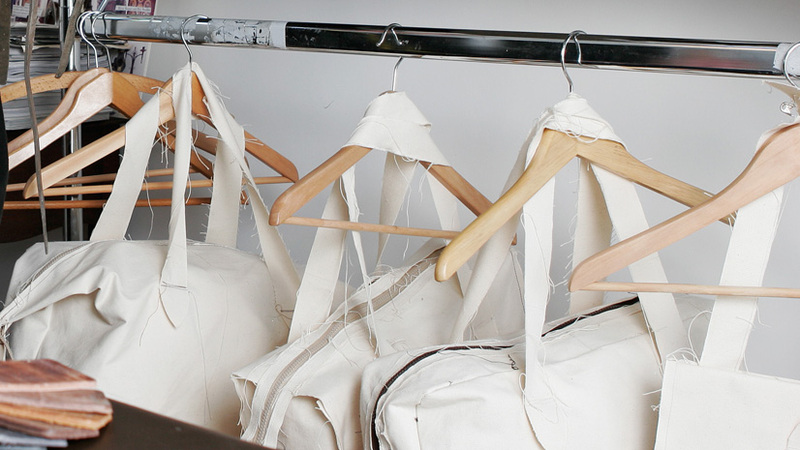 How do you ensure the quality of your garments? Where are they manufactured? 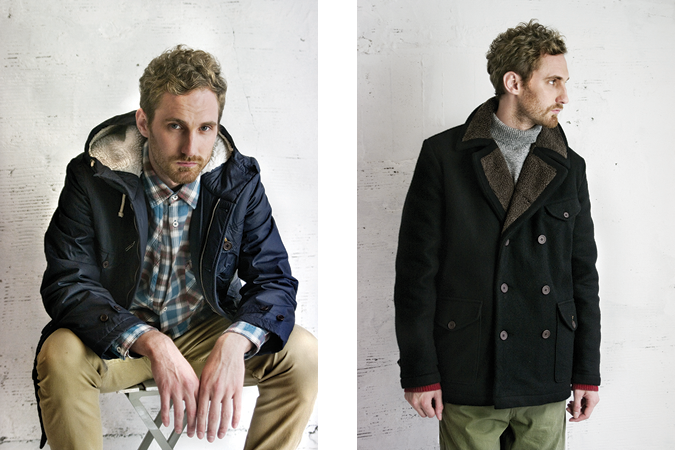 ” All the jackets (both leather and sheepskin) are manufactured right here at our factory in Ivybridge, Devon. The quality is ensured because the operators know they are making an enthusiasts product. The emphasis is on taking time to make a good job. There are no mass-production lines at our factory – it’s a small workforce of a dozen skilled people – after a garment is cut and prepped, the sewing machinist makes the whole garment, from beginning to end. When the garment is finished, it is then quality control checked by another person, who scrutinises the garment for any possible errors or problems – the operators are so conscientious though, this rarely happens. They know what the score is, and they know the customers are keen about these products, so there is no ‘that’ll do’ mentality at all”. Where does your appreciation for historical flight jackets come from? ” I’ve always been interested in the whole WWII aviation thing from as far back as I can remember. I suppose it’s got a lot to do with being brought up in the post-war era as a kid, where WWII stuff was all around us, from tv to toys to model-making etc. Many of the war movies from the 50s and 60s were quite hung-ho about how we won – and they made it look cool (quite different in reality of course, but that’s how we saw it). As I grew up, and realised it was possible to acquire the actual stuff i.e. a real flight jacket from WWII – that was like dipping back into the past and pulling out a part of history that you could feel and smell, making a connection to an era that was otherwise impossible to sense. I still get the same nostalgic feeling even now when I find an old jacket”. What is the personal experience like of creating a quality product and then seeing people wearing the fruits of your labour, particularly on screen? ” I get great satisfaction from a customers satisfaction – because I want them to feel like I would, if I didn’t make jackets, but found something like this. That’s kind of the whole driving force behind any new style I make when its under development – I want to be able to look at it and say ‘yeah, I’d buy that, that’s looks bloody amazing, I got to have it. When we produced all the jackets for the movie Pearl Harbor – which was the first real movie production we supplied – it was quite weird seeing the jackets on the big screen for the first time. We were invited to the movie premier in Leicester Square, which was quite a lavish affair with after show party and all, and when the first scenes of the jackets appeared, I did feel quite an overwhelming feeling of pride come over me”. Do you have a favourite piece from Eastman? What do you wear it with? ” It’s hard to say because I try to make them all favourites, but I find myself wearing mostly the G-1 – it’s such a practical design, it works anywhere – I generally wear LVC or Edwin jeans, along with either Redwing or Buzz Rickson footwear, and Buzz Ts or sweatshirts”. The Holborn visited New York last autumn and among many decadent offerings sampled were the culinary highlights of the Big Apple. So sat we were, three white guys with double barreled surnames at a bar in west Brooklyn scoffing down some pulled pork when we decided to have a mid afternoon drink. A nice Gin & Tonic seemed appropriate, being British and far from home. Now as both of us are adoptive Londoners and exceptionally keen gin drinkers, we thought we knew a fair amount about the world of gin. The association between New York and ‘Mothers’ Ruin’ is not one I have made in the past. It was to my surprise then, when sipping on that expertly made G&T last September that I was pleasantly astounded by the quality of New York Distillery Company Gin. Allen Katz, co-founder and Vice-President – Product Development wrote for us telling us his journey into the world of distilling and the story so far of the New York Distilling Company. 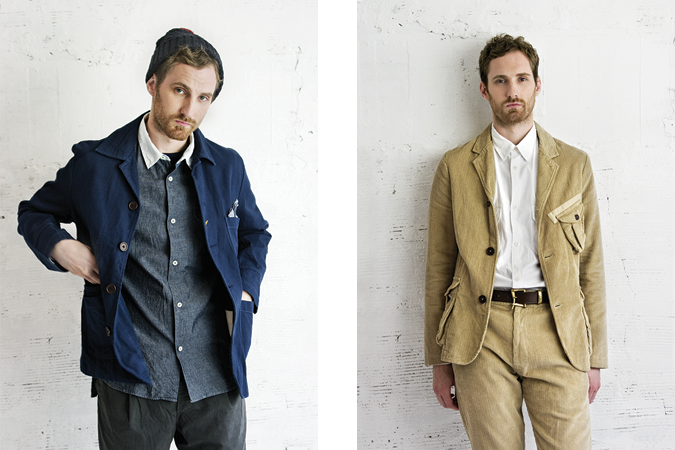 Q&A – David Keyte, Founder of Universal Works. Yet more nourishing insights for the sartorially inclined amongst you today. 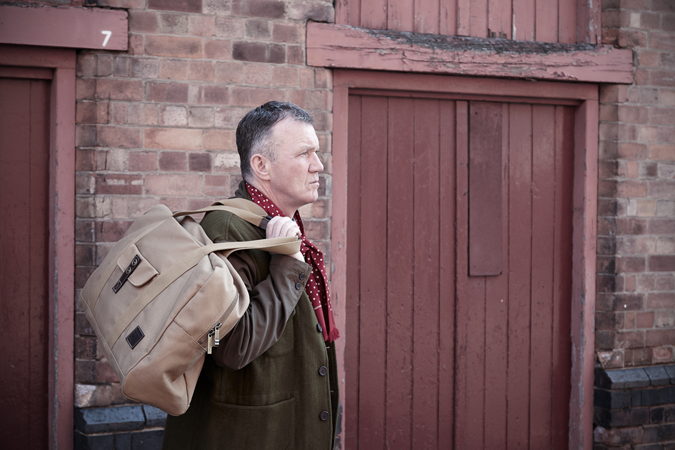 I had the good fortune of catching up with David Keyte, an ex-miner from Mapperly and founder of Universal Works, a Nottingham based menswear label founded in 2008 under a mantra of good, honest British design. There’s a great deal of workwear, military and heritage influences in his clothing, and the pieces are timeless in such that they suit all ages. 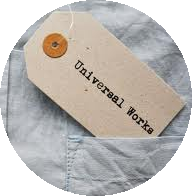 ‘Clothing you look good in” Universal Works calls it. Here is what David had to say to The Holborn.. So how did Universal Works get started? How did UW actually go about getting things made at the start? It started on my kitchen table with a bunch of designs and patterns then a few weeks after the plan hatched we had a 35 piece collection in a London showroom and we got it in front of some great buyers, and we had ten stores buying the first collection which was for Winter 09, sounds easy but I had many years experience making garments for many other brands (Paul Smith) and designers in the UK, working with many factories and makers, so it was not so difficult for me to know how to do this, its just using those years of experience well and finally backing it with my own brand. What do you look to for inspiration when creating new designs? I sit back at the same kitchen table and image what I want to wear in a years time and start working on developing the styles from previous collections and working on fit, shape and proportion, inspiration for me is normally some nutty old guy waiting at the bus stop on my walk to work, or a film or book I am reading, more than any fashion trend. Where do you source the fabrics for you clothing? How do you ensure the quality of your garments? By a lot of hard work, checking prototypes check samples checking production, re checking and re checking, visiting all makers personally during the sampling and production process . What is the personal experience like of creating a quality product and then seeing people wearing the fruits of your labour? Seeing someone in the street wearing Universal Works makes it all worthwhile for me, I love it. Can you tell us a bit about your upcoming Spring/Summer collection? Check out your favourite stockist they will be getting it out in store pretty much about now, its loosely based on a character I called the Torquay Tycoon, I was doing a kind of Rivera summer collection, so lots of stripes and summer patterns, light weight fabrics and printed shirts, but thought it was more fitting to base it on the English Rivera not the French Rivera, more Torquay than St Tropez! and the idea of my dad as a working guy finally making enough money for a summer holiday as a young guy and feeling like a Tycoon being able to buy a new outfit. What one piece has been your personal favourite from Universal Works? Knitted work jacket (below), in wool, it’s made in Nottingham and we have done this style every season since season one back in 09 and its still a great piece, I am wearing it today, it’s merino wool, 4 years old and looks great, but then I am biased! Authors Note: I brought a Red version of the above today from Peggs & Son, Brighton, really, really nice. 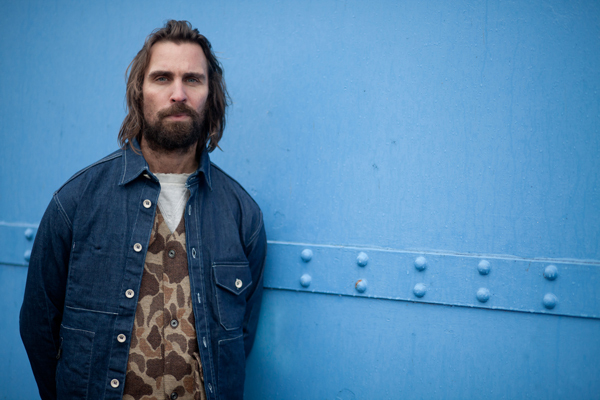 The Artisans: William Kroll, Tender Co.
We return to the British Isles for our next Artisan: Mr. William Kroll, owner and founder of Tender Co.
It’s fair to say The Holborn has been following Tender Co for some time, drawn in by the lure of English made, Woad-dyed Denim. 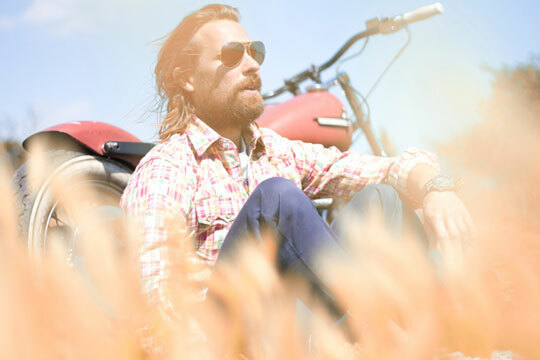 To describe Tender Co. as simply a jeans company would be ignoring half of a great story. Though the brand is primarily based around William’s expertise and appreciation surrounding traditional British Workwear, Tender’s project has spread to designing and manufacturing an eclectic variety of different objects and accessories. These pieces are intend inform the main clothing collection, be they small leather goods and boots cut from the same oak bark and wattle tanned hides as Tender’s belts, or natural cow horn combs hand made in the same English factory as the jackets’ buttons. Since I began writing for The Holborn, I have spent countless hours researching independent purveyors of style, searching for those whose emphasis on individuality and quality are reflected in their practices, and shine out through the quality of their work. From I’ve seen so far it does seem to me that there is something of a gender imbalance when it comes to affordable, quality clothing, and a lack of representation for women when it comes to a range contemporary heritage styles. Perhaps there is a question to be asked as to whether such quality is valued, or even desired in womenswear, and its customers? However from conversations I’ve had with manufacturers, buyers and customers alike this isn’t the case. It seems more that larger brands failing to meet with what is actually very real demand for an increase in quality, and to feature brands with a credible story within womenswear. Gitta Plotnicki is one such person who is striving to change that. Feeling that her own personal style was not being represented on the shelves, Gitta has taken it upon herself to design, create and launch her own brand (Also called Gitta Plotnicki) through which she is be able to communicate her own tastes, styles and sensibilities. Currently doing the rounds at the Capsule trade show in New York and Bread & Butter in her native Berlin, Gitta is showcasing her designs and spreading the word, seeking to get her pieces into stores worldwide. Such as it was, we decided to catch up with Gitta and find out a little more about this exciting new brand. Can you tell us a little bit about the idea behind Gitta Plotnicki? I love the ‘rugged’ style which can be found in men’s clothing. I enjoy reading magazines like ‘Free & Easy’, ‘Men’s file’ and ‘Heritage Post’ with all the great clothing & accessories presented in there. But most of all, I really like the idea of buying something very valuable, that won’t just last for one season: either in terms of quality or in terms of look. 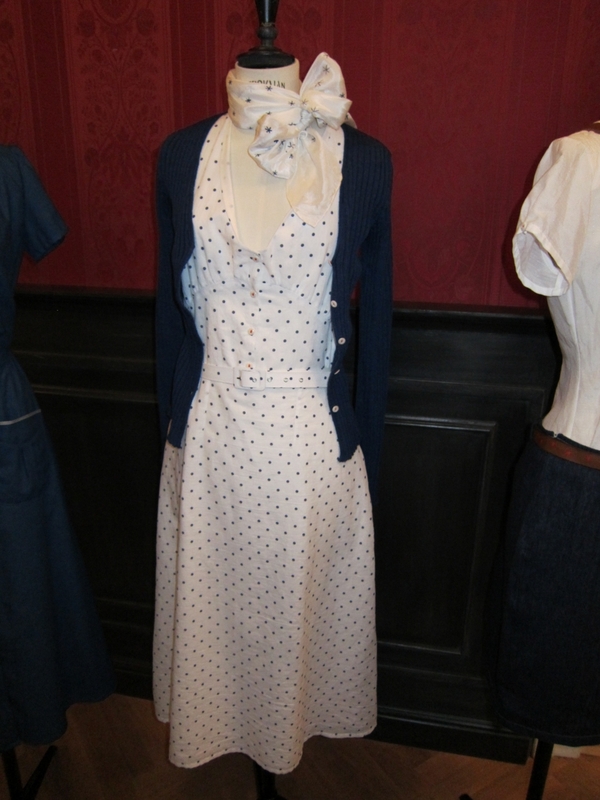 I also enjoy a lot the vintage, authentic look with its heritage twist. Because I couldn’t find it for women, I decided then to make things like this for women. What would you say are the characteristics of your latest collection? The characteristics in general for my collection, is that everything is manufactured in Germany. Also I set great score in high quality production. The fabrics I use are also very special: most of them come from Japan, from old shuttle looms. Mostly they have red selvage or are even are indigo-dyed. 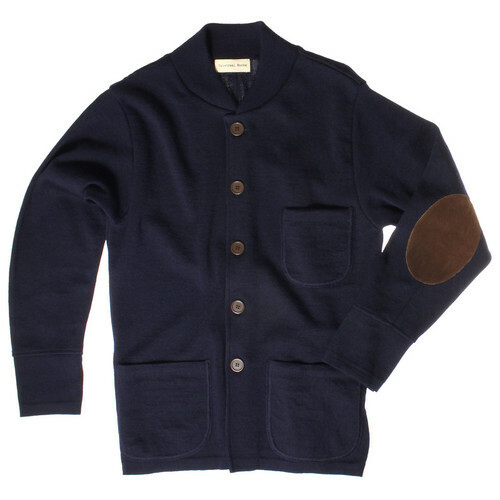 A jacket, a pant and a skirt in navy blue is made of lovely fabric which is 39.3%wool, 32.7% linen and 27.4% cotton. Although it has a ‘classic’ look, it feels very casual. 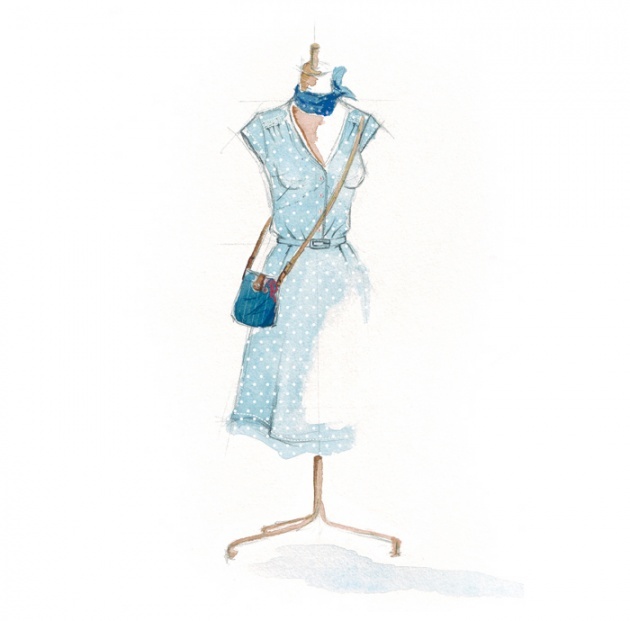 In my latest collection I have a fabric with little woven polka-dots, which is very special. Also I have merino knitwear (this is however produced in Italy, in the very good family-run company GRP). Afterwards it is hand dip-dyed in natural indigo in a little workshop in Germany. Also I have again a range of shirts which are made in collaboration with Merz b. Schwanen on the Swabian Alps, which are produced on original authentic circular knitting machines. Slight irregularities are one of the main characteristics of this fabric. What kind of manufacturing techniques go into making your garments? Like I already mentioned, the more ‘Classy’ styles are manufactured in a very casual style without using too much inlets. Also hand-diped indigo shirts and the woolen styles play an important role. 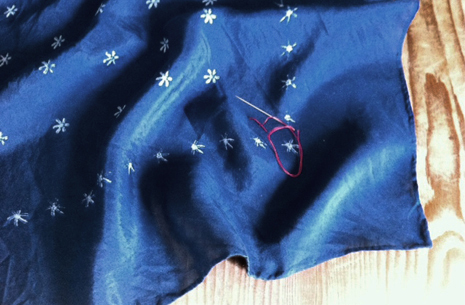 But also I have silk scarves which are made in a very traditional way: the Blueprint technique. It was invented in the 18th century and it is all made by hand. What are the advantages to having your pieces made in Germany? One of the main advantages is that there are not so many long distances between productions: you can go there more often, to check if everything is going well. Also you have the chance to work much more detail-oriented way. Also I like the idea of supporting German companies, who really have to struggle in times of less-loan-cost productions in foreign countries. Not that I think, that those companies and the people who work there don’t also deserve a good-running company. But companies here also have to struggle and they do really very good work. Being together with people who kind of ‘think’ the same way inspires me a lot. I love the Bread & Butter fair: especially the L.O.C.K. area and the fire-department, because so many people with the same state of mind come there and I have so many chances to talk to them, take part of there way of living and thinking, hear their opinions. Also I like traveling a lot: last year we went to San Francisco, Los Angeles and twice to NYC. It was absolutely amazing, what was going on there: so many very good stores ( like Unionmade in SF, Mr. Freedom in LA, American Rag in LA), W.H. Carter, Freemans Sporting Club in NYC and much more… Also I really liked the restaurants and bars: especially ‘La maison premiere‘ in NYC, Paulie Gee Pizza or ISA, ..all located in Brooklyn…oh Brooklyn is at the moment is my most inspiring place. So many creative people with so good concepts: really amazing! What are your hopes for the future of Gitta Plotnicki? I hope, that more and more women will find there way to the rugged style and will also enjoy wearing ‘smart women’s wear’ as much as I do. (Our thanks to Gitta for taking time in her busy schedule to talk to us. If you’re interested in knowing more about the brand, do take the time to check out Gitta’s website and the Gitta Plotnicki blog). Earlier this week I was fortunate enough to make the acquaintance of one of our true favourites; Drakes (of) London. 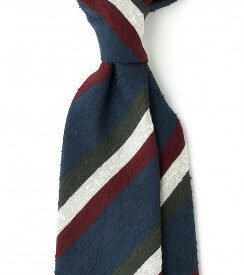 Drakes specialise in making handmade ties and superb range of knitwear and gentleman’s accessories. 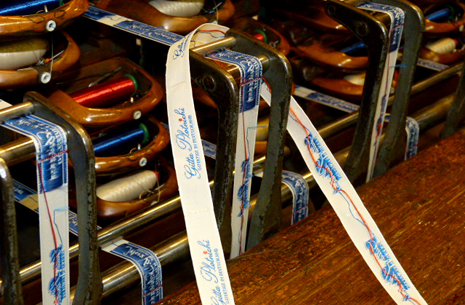 Drakes is currently the largest independent producer of handmade ties in England. 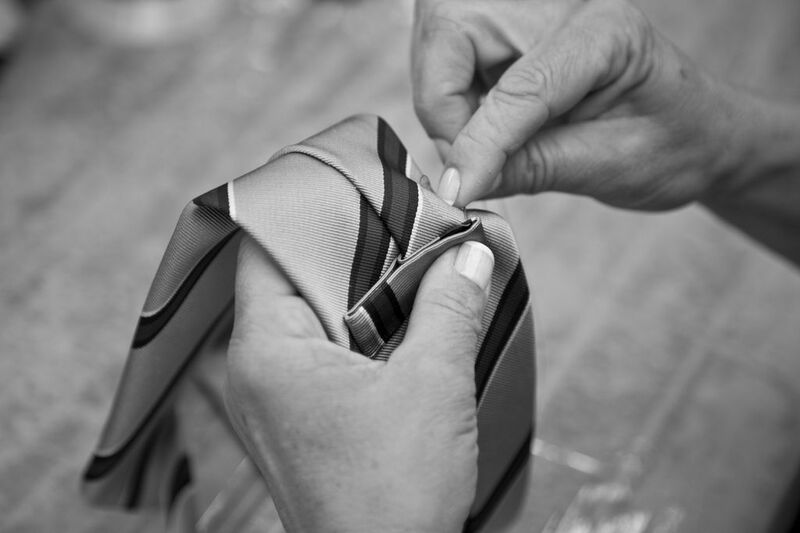 It carries out numerous quality checks on each of its ties, as such that quality has become legendary. The firm has also cemented fashion credentials by collaborating with art student favourite Comme des Garçons and all-American stalwart J.Crew among others (including Holborn favourites; The Armoury and Monocle). 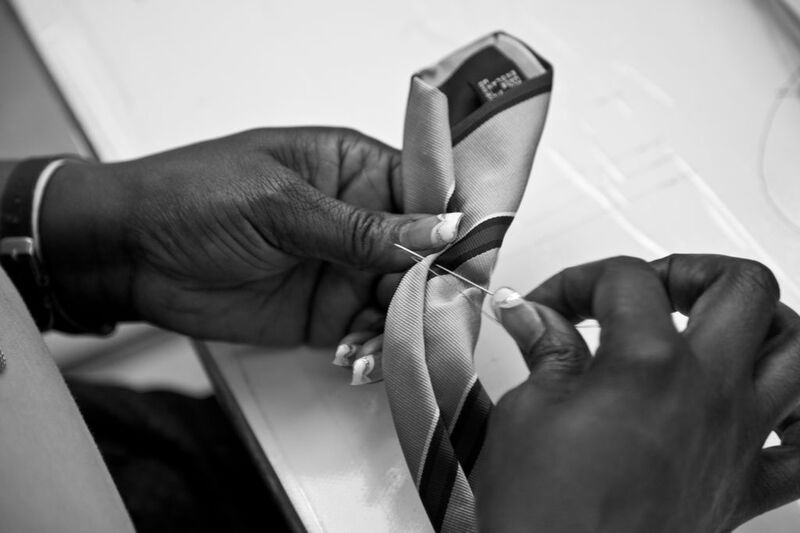 All the ties are still handmade by experienced craftsmen and women at Drakes Factory in East London. 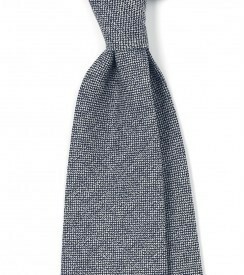 My own personal admiration to Drakes was founded from the two knitted ties that I have from them (by way of Mr Porter). I find them endlessly wearable, matching them up with suits, coats and even a trusty old Barbour – such is their versatility. They also seem to be the ties that people notice at work; the old broker (red faced, claret stained) will lean in and ask ”That’s a bloody nice tie”, ”yes”, I will respond, ”it is”. The quality of my Drake’s ties is such that they have outlasted many others from larger brands, holding their shape, stitching and colour better than the rest. 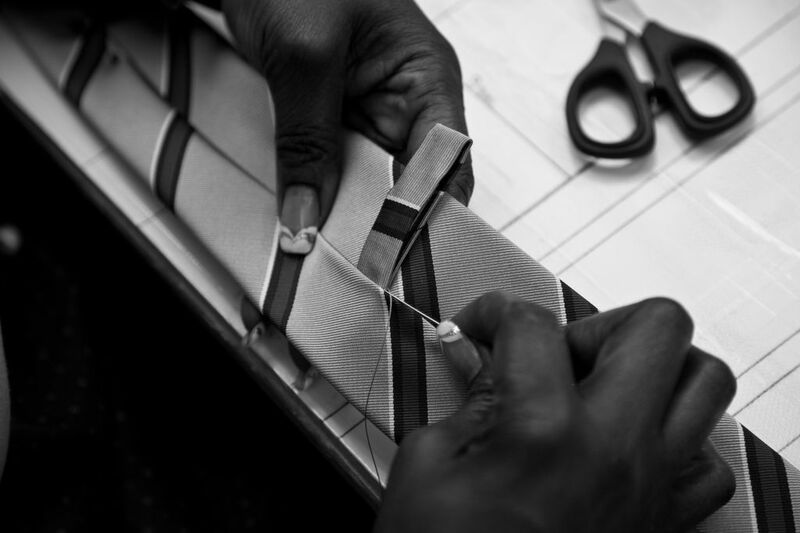 What Makes a Drake’s Handmade Tie So Special? ”Our ties are cut by hand from generous blocks of the finest silks, using a different set of patterns for each quality of silk. 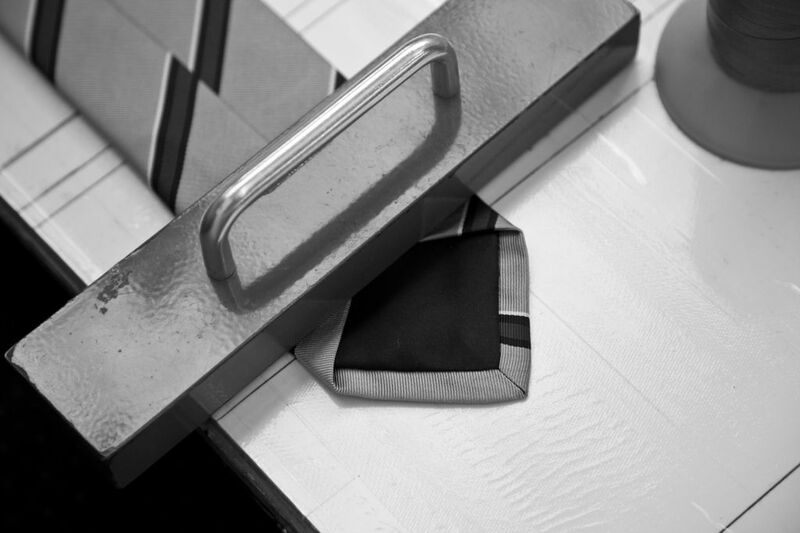 The generous blocks allow all three parts of the tie to be cut “fully on the bias”, and also insure sufficient cloth to create a deep fold at the back of the tie so it can be hand slipped more securely. The three silk tie parts – the blade, neck, and tail – are first joined together, then a pure silk tipping is sewn into the blade and tail. Our 36 oz silk foulard prints are self-tipped with the outer fabric. 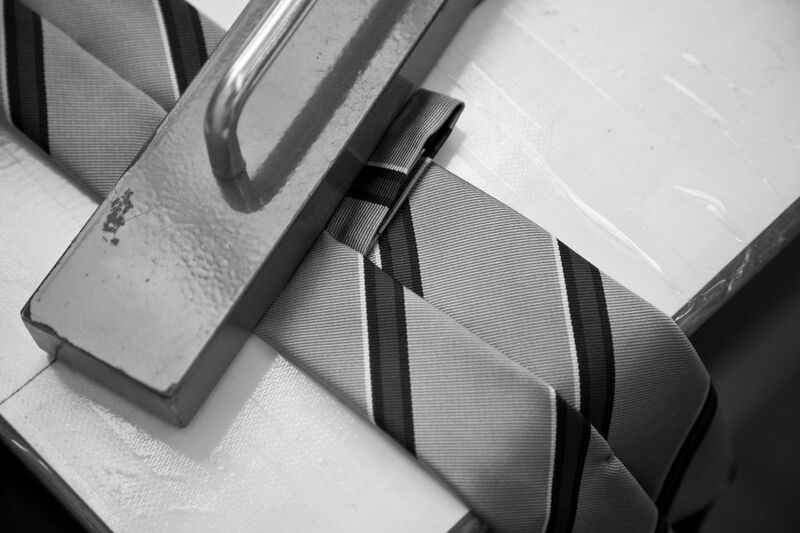 The open-tipped tie is inspected for correct length, precision of the tipping, and smoothness of the jointure. The tie is now ready for the important art of hand slipping. 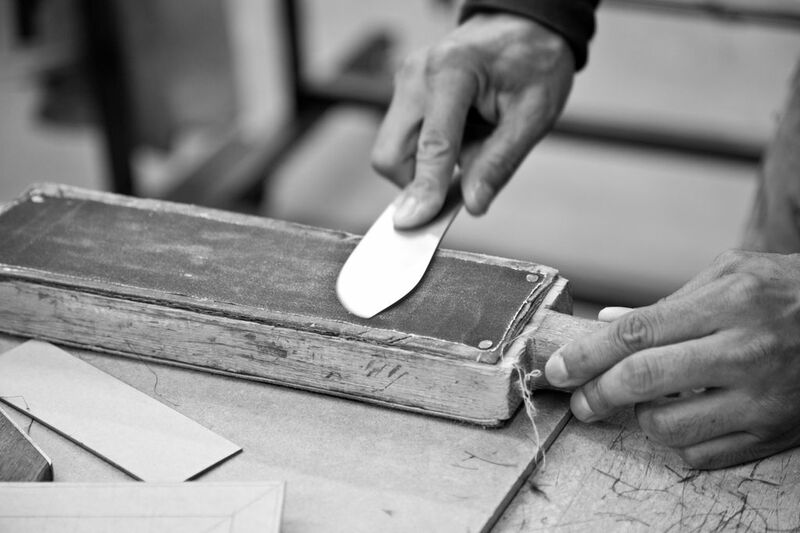 The artisan slipper carefully folds and pins the interlining into the tipped blade until the correct shape has been achieved. Then, using one continuous length of silken thread in the time-honoured classic slip stitch, the slipper joins the tie silk together with the interlining. It’s a delicate operation because the folded back join must be kept in the center of the tie and the interlining and tie silk must be carefully taken up by the slip stitch without piercing the surface of the tie. 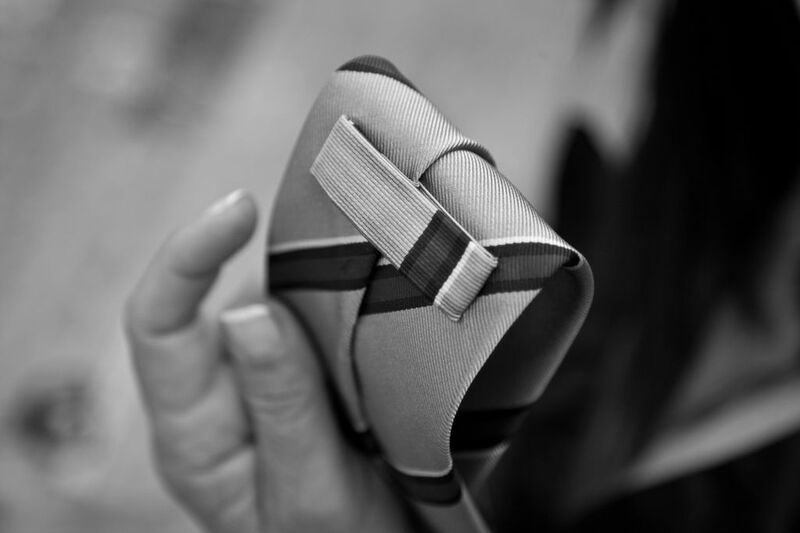 The tie loop, cut from the same silk block as the tie, is then inserted into the back seam at a precisely measured point and caught by the slip stitch. The interlining edges must be firmly against the silk but not taut; no wrinkle or tightness must appear. 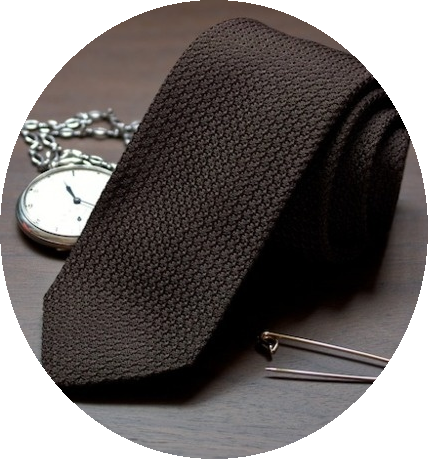 Leaving a slip knot – the functionally important hallmark of the handmade tie – inside the fold at the tail completes the slipping. 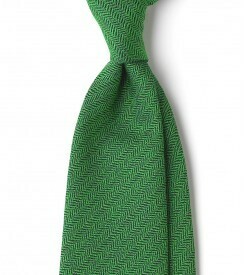 The knot’s function is to take up the stretch in the silk that occurs during the life of the tie. 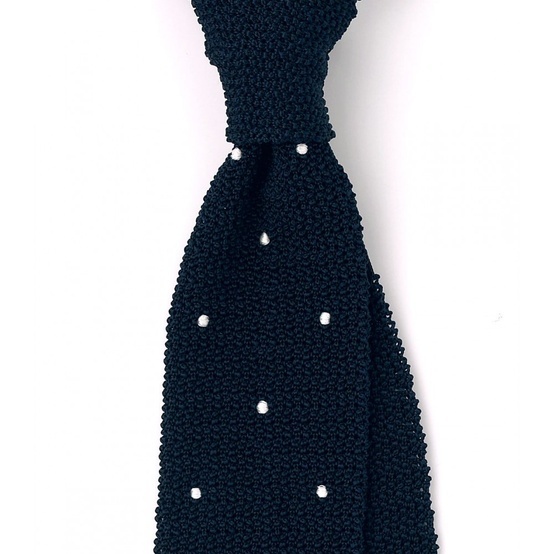 The tie and the interlining are then as one. 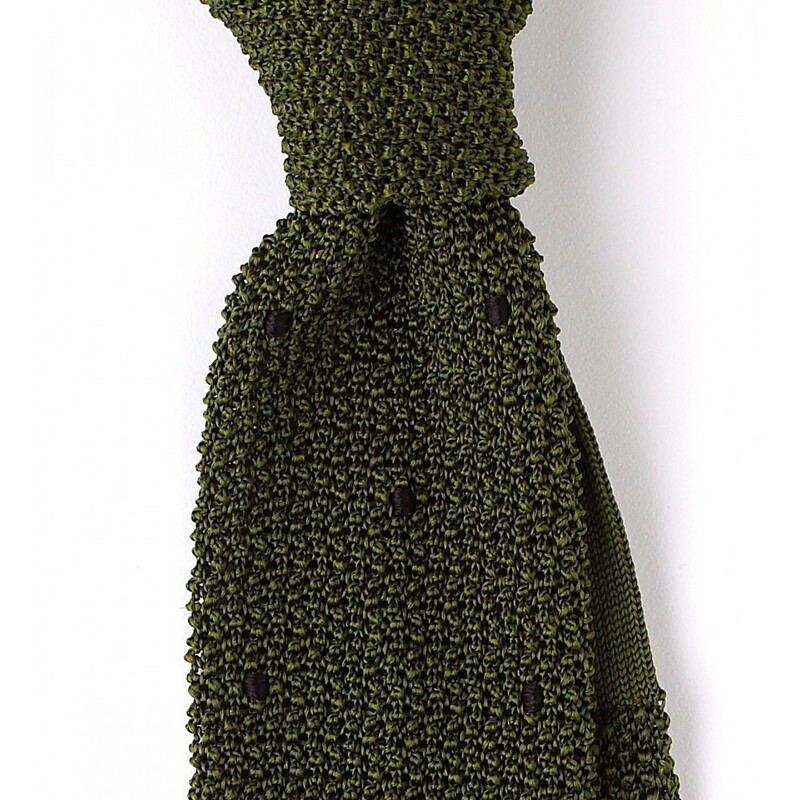 The tie is again inspected, gently hand pressed, and the keeper loop is carefully folded back onto itself and hand sewn at each of its four corners onto the tie. 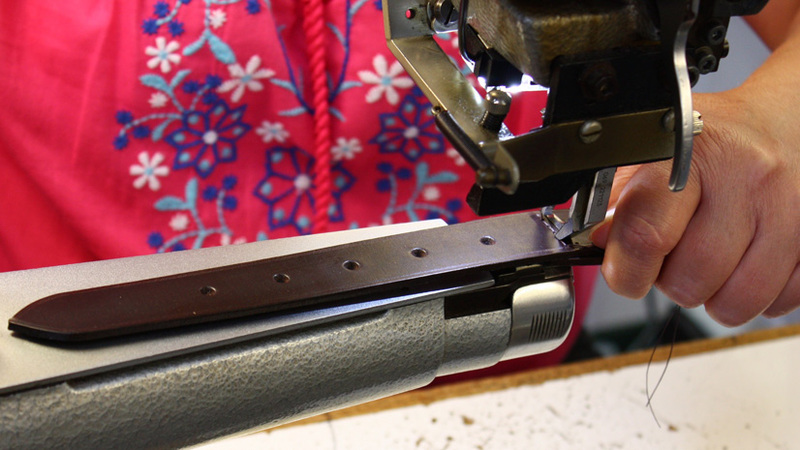 Finally, having undergone 18 separate quality checks during production, the Drake’s label is stitched on by hand. The finished tie is now ready to be put into its protective cover and boxed ready for delivery” . Welcome to our new column ‘The Artisans’. Here we ask Artisans whose work we love and admire to tell us in their own words their story. Why it is they do what they do and why they believe their craft is important. 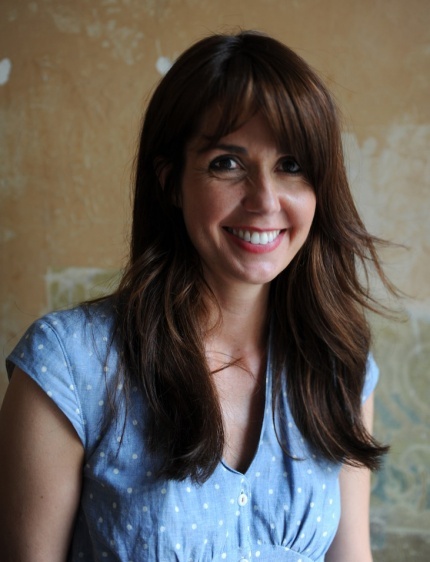 So without further a due I hand you over to our first Artisan, Ayten Roberts of Ayten Gasson Lingerie.